Over the years, I’ve learned as a parent that there is baby stuff that every family must own and those are not really absolute must-haves. I would say that the changing table belongs to the latter category. However, despite being considered unnecessary by some parents, it has shown itself to be a valuable home nursery fixture. If you’re asking yourself what the best changing table is on the market today, read along and let’s find out together! We’ve selected five of the best changing tables that most parents prefer nowadays. We’ve considered their sturdiness, construction, finish, and of course, safety features. Any of these tables would be an excellent option, but as always, we’ll reveal to you our top pick right at the end of the post. Whether it’s across your baby’s nursery or into your bedroom, moving the Graco Lauren Changing Table from one location to another is no challenge at all. It comes with four sets of wheels, something you won’t find in regular changing tables. Of course, the wheels can be locked for security if you’ve found the perfect spot to change your baby’s diapers. .
Another thing this changing table boasts about is its abundant storage space. 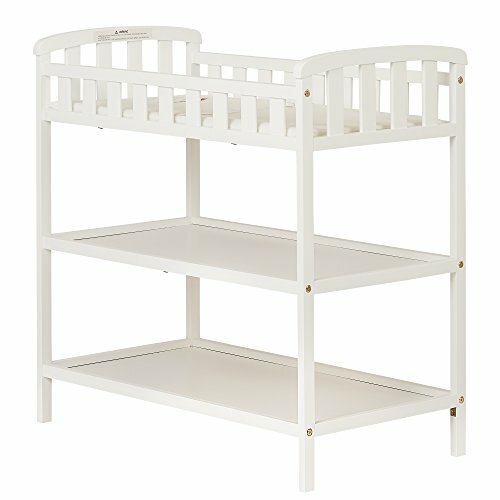 It has two large shelves and has an open design that allows you to keep all your baby supplies within reach. And for safety, the 1-inch vinyl changing pad is surrounded with guardrails and also comes with a safety strap. It’s lightweight and effortless to move around. The large storage holds everything you need for changing time. The modern finish helps it match other furniture quite easily. The changing pad may be too thin. The Dream On Me Emily is a simple yet eye-catching changing table with an excellent traditional design. It’s a three-level station with the lowest and the middle shelves serving as storage spaces for your baby’s stuff. 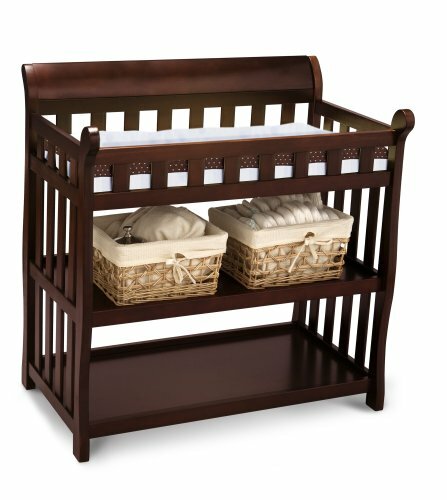 It features a 1-inch changing pad, plus 5’ 1/2”-inch safety rails. The entire table is made of wood and comes with a smooth finish. Despite the fact that this table doesn’t come with wheels, it’s very lightweight and can easily be transferred from one location to another. If you’re not very picky and are merely looking for an excellent changing table with a simple design and serves its purpose well, this might be a good option for you. 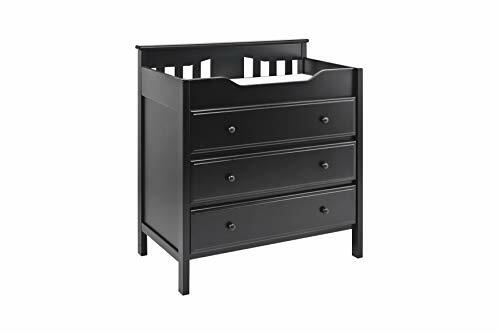 It’s one of the easiest changing tables to assemble; it comes with an instruction manual and its own Allen wrench and can be put together by a single person. It has a sleek design and won’t eat up a lot of space. The safety rails will give you peace of mind that your child won’t fall off. You can’t expect it to be the sturdiest changing table out there. 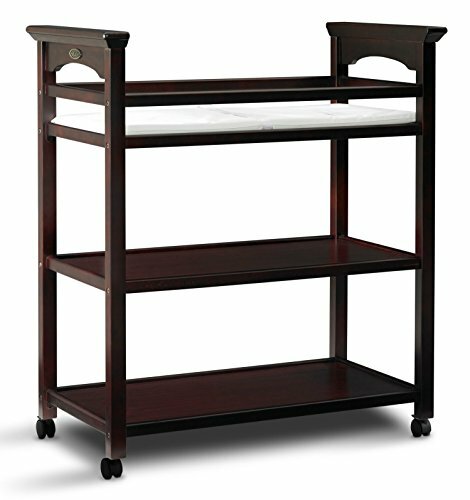 One of the most well-made changing tables available, the DaVinci Kalani can be a perfect complement to any nursery. Its elegant design will make you think twice whether it’s a changing table at all. Unlike most changing tables that come with open shelves, the Kalani features three spacious metal drawers that easily glides for your convenience. Made from New Zealand pine wood, this table can sit stably and solidly on any corner in your home. What makes this table unique is that it lets you remove the changing pad and convert the entire table into a regular drawer once your baby has gone beyond his diaper years. The details on this changing table make it really attractive; the overall design makes it like it’s just part of the rest of the furniture inside the house. The drawer helps prevent your baby’s stuff from being an eye sore. The curve on the legs ensures the stability of the table. The gap between the bars can potentially trap a child’s arm or leg. This JPMA Certified changing table from Delta Children can be more of a second crib for your baby in terms of the comfort and security it provides. It’s not all the time that you find a changing table with high protective rails on all four sides, and that’s what the Eclipse has to offer. Aside from that, it also features two large open shelves that allow easy access to diaper changing items you’re using. Towels, store bins, diapers, toiletries - name it and the Eclipse can accommodate it for you. Most importantly, this table includes a thick water-resistant changing pad with safety strap. It meets all anti-tipping standards so you can be sure your baby is safe on it. The overall functionality of this table is excellent with its wide and spacious storage areas and changing surface. At around 39 inches, this is one of the taller changing tables you'll find. The changing pad that comes with the table may not be of the best quality. The word ‘unique' may not be enough to describe this changing table by Badger Basket. We believe it’s what many parents are looking for nowadays with its innovative design that lets you change your baby’s diaper in any corner - literally! What makes this different from the rest of the tables on our roster is that it lets you easily change your little one with both his feet towards you. The hexagon shape also means there’s room on each side of your child for his essentials so that you won’t have to reach down when you need them. And since it’s a corner table, it’s easily accessible and doesn’t take up much space. It provides plenty of storage without eating up a lot of floor space. Its unique shape makes use of the walls of the corner of the room as a safeguard for falling. Since two sides are leaning against the wall, there's little to zero chance this table is going to tip at all. You’ll have to assemble it inside the nursery, or you may not be able to get it through the door due to its odd shape. 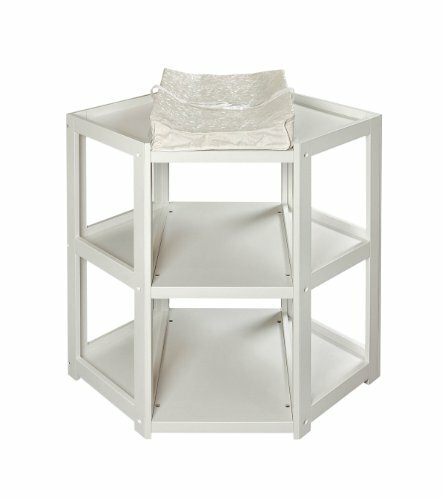 Based on the pros and cons of each of the tables on our list, it’s clear that the Badger Basket Diaper Corner Changing Table is the best option. While all other brands and models are great in quality and performance, what separates the Badger Basket is its innovative design and versatility. The hexagon design is clearly well thought of and speaks of the manufacturer’s eye for detail. As already mentioned, it provides plenty of room where you can place your baby’s essentials without the table itself having to occupy too much space. It also lets you access your child from the feet side (which is how diaper changing should be) while still giving you plenty of space on his right and left. Safety is also not an issue with this table as its design prevents it from either wobbling or tipping. It even comes with a safety strap in case you feel the need to use one. Overall, this corner changing table is a winner, especially if your top criteria include ease of use, versatility, and safety. The Changing Table - A Necessity or a Luxury? Ever since the invention of the modern-day diaper, baby product manufacturing companies have tried to find ways to make diaper changing easier for parents. The changing table (or changing station as it is also referred to) is among the solutions these companies came up with. Over the years, we’ve seen how these fixtures have evolved in terms of functionality and appearance. Today, many parents claim that these tables are no more than a luxury and simply consume unnecessary space. Others, however, can attest to how their lives as parents have improved with the help of this furniture. The truth is that no one can really say that changing tables are not needed in homes. Different families have different needs. Just because having one such fixture may not work for a certain family, it doesn’t mean that the same is true with other families. That leads us to the next section, which will show us how to pick the right changing table that’s right for your context. Statistics tell us that babies will go through about 3,000 diaper changes in the first year of their life. That’s a lot of diaper-changing if you ask me! And that’s the reason that if you’re opting to buy a changing table that you should pick one that’s both convenient and safe for your little one. Here are critical factors to keep in mind when purchasing and setting up a changing table for your home. Most changing tables are designed with thick bases. If it wobbles at all, it’s not stable enough for your child. Pick one that you know is sturdy and will not budge and shake when you put some weight into it. We all want to save space, especially if we have a small nursery at home, but at the same time, we need ample room to place necessary stuff on the surface of the table when we’re changing our baby’s diaper. It’s okay to opt for one with a sleek design, but make sure it has enough surface room or storage levels that allow you to easily reach for the items you need without having to take your eyes off your child. How the surface of the table is shaped is crucial, especially if your child is the type who moves a lot. Pick one with the top shaped as a concave. This will make sure the middle is a bit lower than the sides and prevent your child from rolling and accidentally falling off. Since the year 2000, there has been a yearly average of around 2,500 changing table-related injuries. The changing table is an excellent invention, but its use can also lead to fatal injuries if parents are not vigilant. A good changing table is one with safety features including guardrails that provide babies with additional levels of protection. Some changing tables have safety traps, but while they may see to be a good idea, they can create a false sense of security and compromise your safety instincts. Changing tables can be expensive, and you don’t want one that will simply be useless once your baby has gone beyond his diaper changing years. As much as possible, find a model that can function as a regular storage shelf or drawer when not in use. Speaking of safety, it’s crucial for parents and caregivers to give emphasis to the well being of the children in their care. To make sure you don’t take your eyes off your child during diaper changes, keep all the supplies you need within your reach. This will keep you from being tempted to leave your child unattended even just for a second. Just see to it that you also keep the supplies as near to you but as far away from your child as possible. Secondly, always inspect the changing table before using it, especially if you’re using one in a public toilet or another parent’s home. Checking for stability issues and parts that need potential repair can greatly prevent accidents and injuries. Thirdly and most importantly, even with the presence of a safety strap or rail guards, never leave your baby’s side when changing his diapers. Even the slightest moment that you keep your eyes off of him is enough to spell disaster. What about you, dear readers? What’s your pick of the best changing table? Let us know in the comments section below. And please don’t forget to click the share button if you found this post informational. Thank you!